I grew up on a farm, and though I live in the city now, I’m a farm girl at heart. I would be overjoyed if my husband and I were to have an opportunity to buy a farmstead. The smell of sweet, fresh cut alfalfa and cow manure brings me back to the wide-eyed, carefree wonder of childhood. 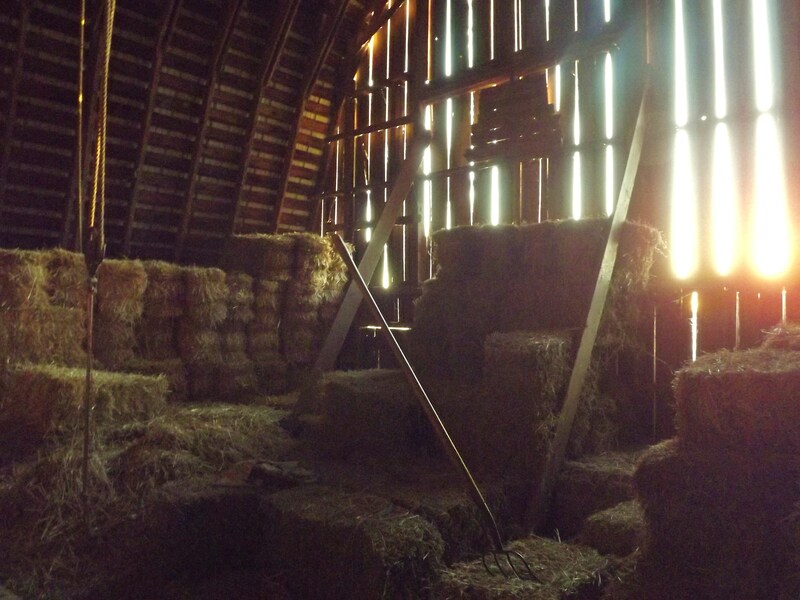 I used to help my dad put hundreds of square bales into this very hayloft. I used to watch him put salt between the layers of bales so that they would not catch fire…I’m still not sure how that works-but I know not to put wet hay bales in the loft without salt or you could have a major problem! I remember throwing bales down from here to feed our bucket calves, and to bed the cows down for those cold winter nights. I remember hauling our trampoline piece by piece into this hayloft during the winter so that my brother and I could still jump on it during the winter. I remember climbing to the top of the bales, and racing around on them. There was a pulley attached to the roof that I used to pull my brother to the roof with…I thought it was great fun, but he didn’t. There were many games of hide and seek in here, and even a Fall Party of my youth group held up here-complete with decorations and food! This photo represents something beautiful to me-wonderful memories of a wonderful childhood. My grandfather was born and raised on this farm, and it remains in our family. The barn-weathered and worn with the streams of sunlight shining through the slats represents a rich generational heritage to me. This heritage is one of love, honesty, and hard work. This barn is the majestic tower overlooking the farm, and within these walls house over 100 years of memories just like the ones I wrote about above. I’m proud of my family-and thankful to God for the opportunity to have played within these walls, and to have grown up surrounded by the loving arms of my family! This photo is available to shine it’s warmth the walls of your home-and now you have the story behind it straight from the photographer! Please visit my Etsy shop at www.etsy.com/shop/RusticStory for more information and pricing information! Thank you so much for taking the time to go down memory lane with me!